"We cherish the beautiful vistas, and those fish tacos were amazing." "We had such a wonderful time on our tour, that we give Keanu's Island Tours a 'double-down-shaka' rating ... THE highest 'Hawaiian-Style Shaka" rating of all. We highly recommend Keanu's Island Tours." For additional testimonials go to "Trip Advisor Honolulu" ... ALL of our Ratings are 5-Stars. "Dear Keanu: Your tour was the "Best Day" we spent on our vacation. We have been to Oahu many times over the years. We’ve done the medium size and 'Big Bus' tours, but NEVER have we seen Oahu the way your driver showed us. It was so "Local" and very different, highly entertaining, and we never felt rushed and always felt safe. We laughed all day and went to places we never even knew existed before. It was 'eye opening' and great fun indeed. The tour was personalized just for our group of five. Besides seeing places on the island that we have never seen before, we got to experience those Hawaiian-style fish tacos and garlic shrimps plates as well ... delicious! And thanks for the free beers and wine. Our driver made us feel so special and when we return to Oahu, we will do it all over again with Keanu's Island Tours. A huge Aloha from us all. Oh, and thanks for the treats & snacks, the many beverages, and the gorgeous gifts." Aloha Keanu: We want to express our sincere thanks (Mahalos) for one of the best tours we have ever experienced in our travels. Per your promise, you took us to those special 'out of the way' places and fulfilled our every request. Everyone in our family, especially our children, had a memory filled time. You were not only very entertaining but a great teacher of Hawaiian History & Language. Our tour was THE highlight of our time in Hawaii. We would recommend you to anyone who wants to enjoy an amazing, fun-filled day on your island. Thanks again for making us feel safe at all times and taking such good care of us." "Aloha Keanu: This was our third visit to Hawaii and your tour was one of the best we have ever had. On your tour we saw things we never knew existed. Who would have thought that we would witness sea turtles and monk seals on the beach ... so up close and personal? Your tour was spot-on, and thanks for the gifts, the refreshments, the treats, and the memories. Also, we appreciated that you were ‘on time’, had a clean van, a safe ride, and we all enjoyed the Hawaiian music. Our children send their ‘Aloha’ to you. Cheers." "Aloha to our new friend Keanu: Our family had the time of our lives. We cherish the beautiful vistas, the swim at Waimanalo Beach, and those Fish Tacos were amazing. Wow, waterfalls, breathtaking scenic lookouts, boogie boarding in the ocean, great local food, really cool shopping … so much fun! We especially enjoyed the history about your island and Hawaii in general. Our teenage daughter, Sarah, said she had an awesome time. It was for us, the perfect day. Famous Waimea Bay, where in the winter, the waves get to be 30 to 60 feet high at times along with brave/crazy surfers trying to ride hem. We will watch from the safety of the beach. We keep $1,000 Fujinon Binoculars in each van. This is Eternity Beach, named after the movie 'From Here to Eternity" where Deborah Kerr and Burt Lancaster had that famous romantic kiss in the sand and waves. 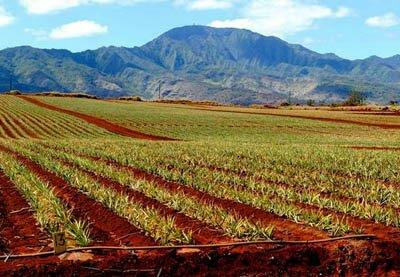 Pineapple Fields Forever ... on the North Shore with the Waianae Mountains in the background .. and coffee fields on the other side of the same road.